Note: This article is old no longer and this is not true anymore, Tomcat is now bundled with Netbeans so the steps in this tutorial are not needed anymore. You can download and install the bundle from the official page. I’m assuming you are using at least Ubuntu Linux 11.10 and you already have installed the the latest Netbeans 7.1 with the Java Web Applications plugin installed. I also assume that you want to install and configure Tomcat from the repository, if you don’t care an easier method would be to just download apache-tomcat.zip from the Tomcat website, extract the archive to a folder under your home directory and just skip to step 4 of this tutorial where Under Server Location you would browse to where you extracted the archive and under Username and Password you would put the username and password you would have put in tomcat-users.xml. Tomcat does have any users defined that could be used for administrative purposes so we need to open tomcat-users.xml in a text editor and add a user with the proper roles assigned to it. Now that you have Tomcat installed and configured we can open up Netbeans and under the Services tab right click on the Servers node and click on Add server. In the current list select Apache Tomcat and click Next. 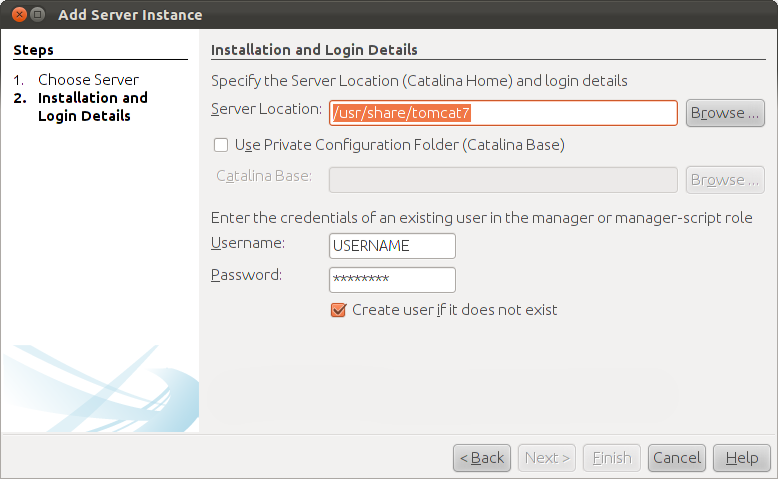 Under Server Location enter your Tomcat installation directory , by default this should be /usr/share/tomcat7 and under Username and Password put in the username and password that we added in the tomcat-users.xml file. Click Finish. You should now be able to see Tomcat as an added server under the Servers Node.